As the term environment deals with the behavior between the living organisms and the median where they live which is scientifically known as the gas layer that surrounds the earth (air), and consisting of some gases that could be considered as the major factors of the main life components. Modern human innovations, such as boilers, furnaces, heaters, cars, trucks, ships ….etc., emitting high gas eliminations leading to the imbalance of the natural components of the air specially the unbelievable increase in carbon oxides causing a direct threat on the human health. Being exposed to what exceeds 30 ppm of carbon monoxide concentrations may lead to death. Headaches, nausea, breath shortness, chest pains, losing control, fatigue and many other that seem to be some symptoms of a common cold, are resulting direct and indirect exposing to less carbon monoxide concentrations, depending on the age, health, the concentration of the inhaled gas and the duration of expose. At the time, while Egypt is suffering from over population, an increase in pollutant ratios and a decrease in the national income problems, the need to find a solution in order to increase the national income and reduce the pollutant ratios becomes a necessity. A one of which that could be an easy, powerful and most prominent way of reducing carbon emissions is what is known as wood pellets. The way of how to make use of straw, dry leaves, branches, grass, palm fronds, carpentry and wood working residues, wooden construction remains and even trash in order to get a powerful source of energy is called wood pellet manufacturing. Egypt in general and the city of Damietta in particular is one of the richest areas in wood wastes. The way of using about 33 thousand tons of wood wastes annually generated from nearly 150 thousand factories and workshops located in Damietta, [1,2] rather than what exceeds 23 million tons of palm fronds, straw and other agricultural residues in order to generate a renewable energy resource such as wood pellets either as an independent small project or attached to some of the existing factories is the main theme of the research, while using of wood pellets production lines in order to reduce the wood residues, carbon monoxide emissions and increase the Egyptian national income could be stated as the main research outcomes. The term environment could be easily described as the science that deals with the relation of living organisms with the place where they live. The different kinds of gases surrounding the earth such as oxygen and nitrogen which are considered the life's constituents of all living organisms could de defined as the atmosphere. The disorder or change in the percentage or concentration of any of the atmospheric components could lead to negative effects on all living organisms. Modern human activities has had a major impact on the imbalance of the natural components of the atmosphere caused by various and modern human innovations such as boilers fireplaces, furnaces, heaters, cars, trucks, etc., in such a way causing a serious threat for the whole life in either a direct or an indirect way. The direct exposure what exceeds 30 ppm of carbon monoxide concentrations is considered a serious risk that may lead to death, while some symptoms such as headache, dizziness or nausea, shortness of breath, chest pain, inability to control, fatigue, etc. could happen when exposed to lower concentrations, depending on the health status of the person, age, concentration of gas inhaled and the duration of exposure. In order to decrease the enormous rising in the percentage of carbon emissions clean, renewable and eco-friendly energy resources should be sought. In this regard using of wood wastes in the form of wood pellets could be stated as an effective energy resource that could decrease the high rates of carbon emissions. That topic was presented at that time due to the existence of some promising investment opportunities based on the increasing demand of wood pellets, especially used in cold areas for heating purposes, in a way that can achieve a qualitative leap for the Egyptian economy and may lead to a raise in the national income. Wood pellets production units could be constructed from wood waste, either as an independent small project, or to be attached to factories where these capsules could substitute other fossil fuels (coal, natural gas, diesel or diesel) in various production processes, especially in cement production , which will lead to significant reductions in carbon emissions that threaten human life. Descriptive analytical method is used relying on the compiling, comparing and analyzing of information and facts in order to get acceptable perceptions, ideas and considerations. The process of transforming organic fuels to energy through collecting of the non painted fine and rough wood wastes and storing them in absence of air in order to avoid its degradation or mold growth. The humidity percentage of the wastes should be reduced from 50 - 55% to 8 - 12% at maximum. 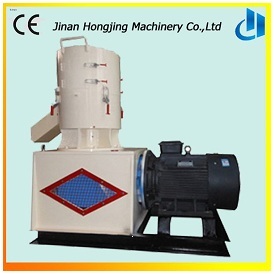 Sawdust, fine wastes and the rough ones that doesn’t exceed 300 mm × 250 mm (width × Thickness) are directly taken to the grinder or hammer mill, while bigger wastes should be firstly divided into smaller pieces (Figure 1) . After milling, the product is filtered and purified from various types of impurities, such as paper, metal and plastic, in a process known as shakers. The resulting sawdust is placed in a mixer or feeder forming a paste, which is then passed or compressed through a perforated surface with the desired dimension (usually 6 mm and sometimes 8 mm). The capsules are then cut by an automatic cutter or pellet machine, and then left for cooling to be ready for use (Figure 2) . Wood pellets are divided into two types, first the flat die, in which the waste paste is passed through a perforated disk. Many spare parts are consumed in that, due to the intense heat generated by the production processes (Figure 3). 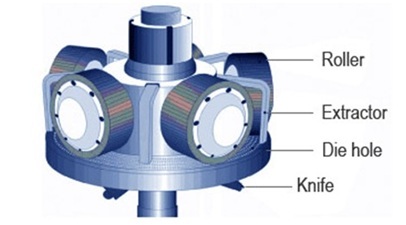 The other and most effective, but the most expensive type is the ring die one, in which the paste is passed through a perforated ring. That type is used in larger scale units with higher productivity. For smaller projects with lower production capacity, the flat die pellet is preferably used (Figure 4). Energy capsules are packed in either 25 kg bags per bag or in 50 × 50 × 70 wooden boxes and then transported to the place where it is used. Pellets are distinguished by its as low humidity (less than 10%), which allows them to burn with high-yielding outputs, as well as being highly dense, allowing easy practical storage and transportation facilities. As the studies have shown that the thermal efficiency of ovens and boilers had increased by 85% with carbon that doesn’t exceed 250 ppm, the researchers aim to reduce carbon emissions by 40% by 2030 through using energy pellets as a source of fuel rather than other currently used fossil fuels [9,10]. 1. Using of wood-pellets could reduce the carbon monoxide emissions. 2. Wood-Pellets production lines could be used as a solution to increase the Egyptian national income as the price of only one packed ton of wood pellets in the world market is between 220 $ and 369 $ , and the demand of wood pellets around the world is enormously rising (20.3 million tons in 2015) . 3. Wood-Pellets production lines could be a suitable and an appropriate solution to get rid of wood residues and wastes especially in Egypt. 4. Agricultural residues could be also used in wood pellets generation but with lower energy impact and greater percentages of nitrogen and that is due to the use of fertilizers that are rich in nitrogen. It is recommended to stimulate, support and encourage young business men towards the role that each of them can perform leading to the public and private benefit through the establishment of wood pellets production units, which ensure the provision of a clean, more efficient and green source of energy, as well as the safely disposal of large quantities of wood wastes generated from various manufacturing processes, that could preserve the urban and aesthetic appearance of the cities. First crusher or wood grinder or Hammer-mill with a Siemens 11 KW motor, production capacity 200 - 400 kg/h, 400 kg weight, dimensions 1200 × 580 × 950, 380 V .
Second 2 Wood pellet flat-die machines with a Siemens 11 KW motor, Production capacity 100 - 200 kg / h, weight 600 kg, dimensions 1000 x 450 x 960, 380 V.
Some personal interviews with carpentry workshop owners recorded and organized by the author. Pellets@las (2009) Advancement of Pellets-related European Standards. Pellets@las, Munich, Germany. Clarkson University (2017) Researchers reduce Co emissions from stored wood pellets. Biomass Magazine, Grand Forks, North Dakota. Petrocelli D, Lezzi AM (2014) Co and No emissions from pellet stoves: An experimental study. J Phys: Conf Ser 501: 1-12. Kang SB, Sim BS, Kim JJ (2017) Volume and mass measurement of a burning wood pellet by image processing. Energies 10: 603. Figure 1: Hammer Mill . 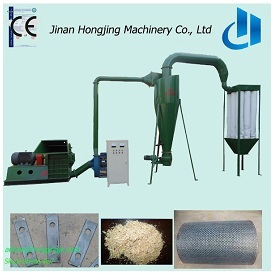 Figure 2: Wood pellet machine . Figure 3: Flat-Die wood pellet. Figure 4: Ring-Die wood pellet . Citation: Mohamed MMM (2018) Wood Wastes: An Optimal Solution that Could Reduce the Threat of Co Emissions on People Lives. J Environ Sci Curr Res1: 002. Copyright: © 2018 Mohamed MMM, This is an open-access article distributed under the terms of the Creative Commons Attribution License, which permits unrestricted use, distribution, and reproduction in any medium, provided the original author and source are credited.